In spite of their names, most ghost towns aren't haunted. Most of them are just empty, and in many cases, they're almost invisible, too. Such a settlement is Skidoo, a gold mining camp in Death Valley whose physical presence is so hard to see that her memory is kept alive by a sign erected by the National Park Service. Skidoo reached the pinnacle of her success in 1907, when around 700 people called her home. 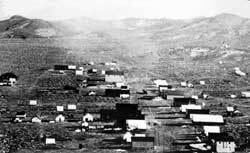 The town had a newspaper, a bank, a school, a brothel, telephone service, and at least one saloon. By 1916, however, the population of Skidoo had pretty much skedaddled, and since then desert scavengers have carried off everything but several piles of broken bottles and rusty cans, some tangled barbed wire, a couple of sets of bedsprings, a chimney, and some rusty pieces of corrugated roofing. Skidoo's remains are hardly worth a journey except for those who like to poke around in old mining shafts. The hills around Skidoo are riddled with them, and the park service takes pains to warn visitors of the dangers. What the rangers don't mention is another potential peril, the town's unhappy ghost. We learned about Skidoo's phantom from a man who has spent much of his life exploring the deserts of the American west. Joel Briggs, AKA the Desert Drifter, shared the legend with us of how, on the afternoon of April 22, 1908, Joe "Hootch" Simpson shot and killed Skidoo's banker in cold blood. Unable to wait for the slow wheels of justice to turn, the enraged townspeople meted out a swift penalty: they hanged Hootch that night on a telephone pole next to the sheriff's office. Does Hootch haunt Skidoo? Over the years, as Joel Briggs reports, several visitors to the townsite have reported the sounds of gunshots and men talking on April 22. Some match up precisely with the time of the banker's death and Hootch's hanging. Would it happen again this year? There was only one way to find out. On April 22, 2002, Mark, Marvin, and I bumped along the narrow washboard track west of Stovepipe Wells to find out. The first important time was 2:00 p.m., when Hootch shot Mr. Arnold, the banker. But did Skidoo observe Daylight Savings Time? We didn't know, so we decided to pay attention at 3:00 p.m. as well, just in case. We arrived at Skidoo before noon and took our time trying to envision the layout of the town. A photograph on the park service sign was a help, but the street grid of downtown Skidoo has been virtually erased from the barren hillside it once occupied. Around 12:30, I heard the tinkle of a bell, like a cowbell ringing far away. Mark heard it, too. Around 3:00, while I poked around in a tin can midden, Mark and Marvin hiked up a hill to see what they could see. When they came back, Mark said, "Did you call me while I was up there?" "Well, someone did. Marvin heard it, too." Like Skidoo itself, there isn't anything more to report. A bell and a shout, but no gunshots and no men talking. Was it Hootch, or was it just a couple of sounds traveling farther than usual in the desert silence? It's tempting to claim otherwise, but I suspect the latter. That night, camping under a full moon, we drank a toast to the spirits of Hootch Simpson and Mr. Arnold. Even if they hadn't come to haunt us, their ghostly appeal had enticed us on a memorable roadtrip we would never have taken without them.